Southern States Sporting Bird Starter (AVT) Medicated is a complete starter feed for gamebirds and turkeys. Its crumbled form prevents separation of micronutrients to ensure that developing chicks and poults get all the sustenance they need. The antibiotic lasolocid is for the prevention of coccidiosis. 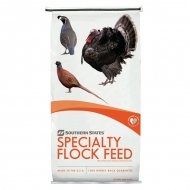 Give your birds a good head start with Southern States Sporting Bird Starter (AVT) Medicated. Southern States Sporting Bird Flight Developer (BMD) Medicated is a complete feed for gamebirds and turkeys. Its crumbled form prevents separation of micronutrients to ensure that developing chicks get all the sustenance they need, and its antibiotic additive prevents common ulcerative enteritis infections. 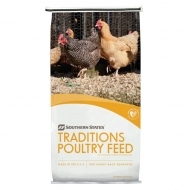 Southern States Traditions Poultry Maintainer is an ideal poultry feed for all mature adult birds. Chickens, turkeys, gamebirds and specialty fowl will all benefit from this comprehensive blend of crude protein, vitamins and minerals. For an excellent all-purpose feed, you need Southern States Traditions Poultry Maintainer. 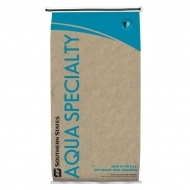 Southern States 18% Waterfowl Feed is a complete feed for ducks and geese aged 4 weeks until maturity. Growing waterfowl will develop brighter plumage and better muscle tone with this floating extruded pellet feed. 18% crude protein and a full spectrum of vitamins and minerals help you grow healthy, happy birds. If your flock floats, you need Southern States 18% Waterfowl Feed.